This is the second assembly which works fine. 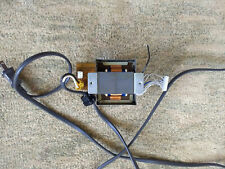 Faceplate parts for Sony TC-WR901ES Dual Tape Deck. all boards, buttons & knobs. Condition is Used. Plugged it into my refurbished deck and all buttons and features work perfectly. Together we will solve Your problem. Sony TC-WE405 Dual Stereo Cassette Deck for Parts or Repair!! Ready To Restore!! Play cool songs and enjoy this classy unit! Ready to work on and perfect for the on the ball technician! For parts or repair only. Powers on fine but might need a new belt for playback. Sony TC-WR535 Double Cassette Deck Stereo Tape Recorder PARTS OR REPAIR . Condition is For parts or not working. It makes a short hum when turning power on and has some scratch wear on the top as pictured. Shipped with USPS Mail. SONY STEREO CASSETTE DECK TC-RX390. POWERS ON BUT I BELIEVE BELT NEEDS TO BE REPLACE. Unit DOES NOT play, fast forward, and rewind cassette tapes. Cassette tape doors opens and closes without any issue. All pictures are taken in house. Warranty:AS-IS FOR PARTS OR REPAIR. BEING SOLD AS-IS FOR PARTS OR REPAIR. Sony TC-WR535 Dual Cassette Deck Tape Recorder For Parts. Tested and seems to play cassette too quickly. I was also unable to get any sound output for this player. This unit is being sold as is for parts or repair. It powers on, but the cassette tray does not eject. Sold as is for parts or repair only. Sony TC-WR531 Stereo Cassette Deck Auto Reverse. Parts/ Repair. LC-T-4245 (9/LB-5x17x12) ER. Salesbaron is in Los Angeles, 90039. NO ACTION WHEN TRYING TO PLAY CASSETTE AND DECK B IS STUCK SHUT. FOR SALE AS IS FOR PARTS OR REPAIR. AS IS FOR PARTS OR REPAIR. Unit powers on, but when I hit play the tape does not actually spin. For this reason, it is being sold AS IS for PARTS or REPAIR. 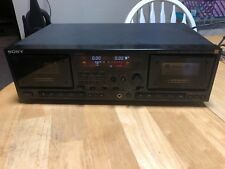 Used Sony TC-WR445 Dual Cassette Deck. Is missing a couple of nobs on the front and tapes just stop when playing. For parts only. Sony Stereo Cassette Deck. The unit does not turn on at all. There could be a simple solution, but I did not investigate further. If you can fix it, this could be an amazing bargain! Otherwise, could be used for parts. IN USED CONDITION, DECK A DOESN'T WORK. DECK B WONT PLAY. MISSING BALANCE KNOB. BEING SOLD AS-IS FOR PARTS OR REPAIR. CHECK OUT PICTURES. This sony tc-v7 powers on but does not open. TC-WE435 DUAL CASSETTE DECK FOR PARTS/REPAIR. That is why you get such good deals. If we have tested it, we will let you know how we have tested and for how long. Usually no more than just powering a unit up to see that everything boots and works. Found out only the left side works (deck A). The right side keep jamming and get stuck with no audio (deck B). Missing one feet, see the last picture for more details. Sold, As-Is for parts/repair. Powers up but does not play tapes. Sony Stereo Dual Cassette Deck TC-WR741 For Parts. Condition is For parts or not working. May just need belts. Sony TC-206SD Tape Deck Machine For Parts Pick Up Only. Condition is For parts or not working. Does not turn the cassette. Local pickup only. Untested no power parts and repair only. Comes on your can hear it moving just doesn't move the cassette. Think the belts just need to be changed! !